What is the difference between grading on Free and Pro? You can grade all of your students' work on CodeHS with both the Free Plan and the Pro Plan. There are different ways to grade depending on which plan you are using. With the Free Plan, you will primarily grade submissions one at a time from your Code Review Dashboard or from a specific student's user page. Read a detailed breakdown of the different ways to grade on the Free Plan here. With the Pro Plan, you will have access Magic Grading. 1. Queue Settings allow you to be more selective about which submissions you want to grade and which submissions you want to let our autograders take care of. With this tool, you opt in to which exercises you would like to grade after they have been passed by our instant feedback system. With Pro, you also save time by grading submissions using either Fast Grade or Grade Mode. Both of these tools allow you to work through your submissions continuously without needing to go back to your dashboard or open multiple tabs. 2. 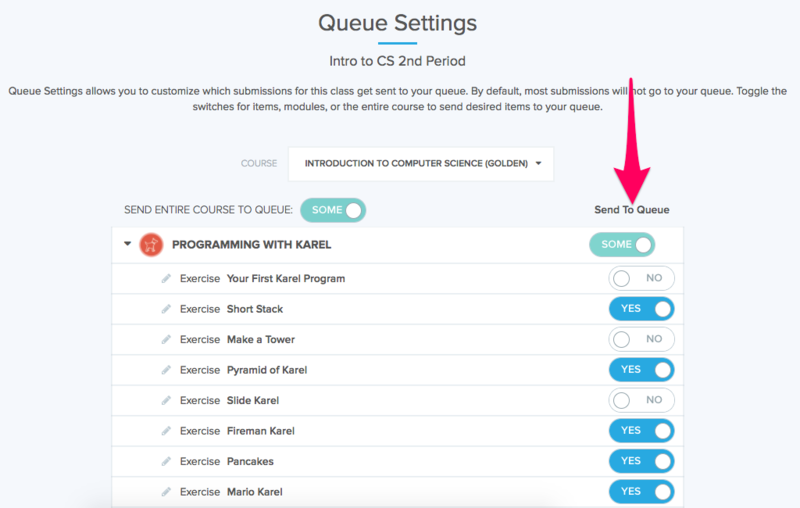 Grade Mode can be used to run a student's code before assigning a grade and sending feedback. You can read more about how to use Grade Mode here. 3. Fast Grade is the best tool for working through submissions quickly. 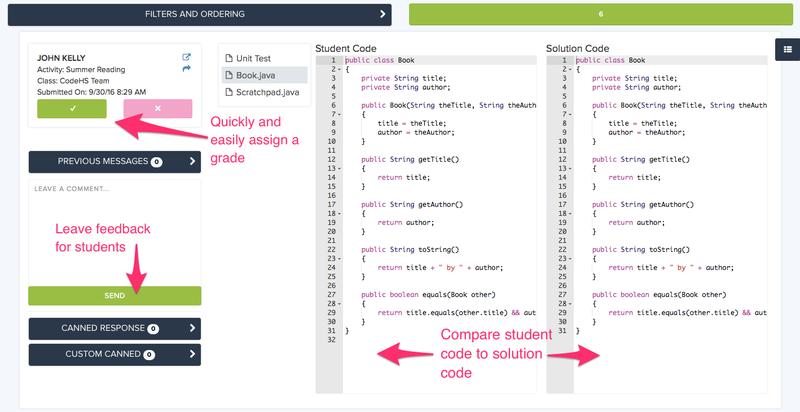 View student code and submission code side-by-side, send feedback, and assign a grade all in one window. Learn more about Fast Grade here. 4. The Automatic Gradebook makes it easy to keep on top of your grades. Teachers can use our gradebook to translate student progress through courses into letter grades that they can pull out of CodeHS. Use our recommended point values or customize them by setting your own. Learn more about the Automatic Gradebook here.